New Delhi: After Congress indulged in “fast politics” by lodging Party leaders at Rajghat as part of their nationwide hunger-strike against Modi government’s failures, bur two of heir own faltered as Party leaders Arvinder Singh Lovely and Ajay Maken found themselves in a pickle after they were photographed eating chhole bhature in the morning, just ahead party’s scheduled day-long hunger strike at Rajghat. The event, which entails a day-long fast to promote communal harmony at Rajghat. On Tuesday, Akali Dal protested outside Congress Office against Sajjan Kumar,Jagdish Tytler been given space at the Anshan at Rajghat yesterday. 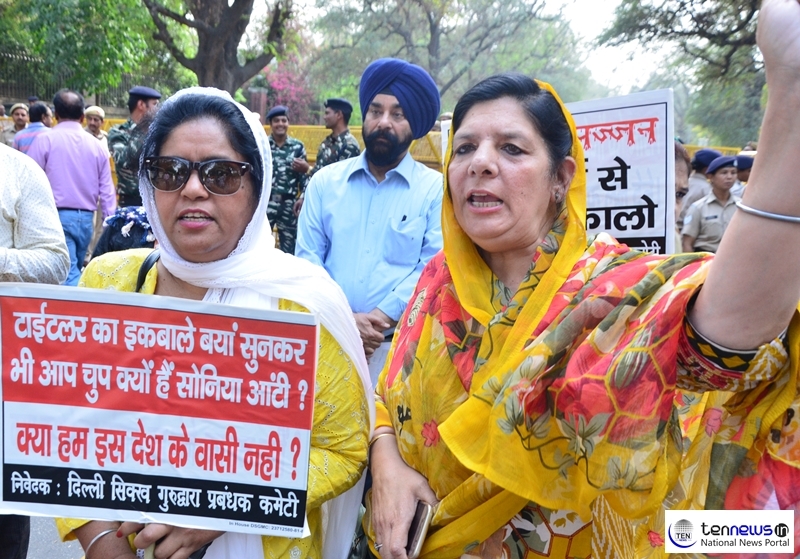 The Akali Dal’s Protester demanded that Congress President Rahul Gandhi should expell the leaders associated with ’84 riots & Prime Minister Narendra Modi must ensure justice for the victims of the riots. Speaking to Ten News, Akali Dal’s Protesters Said, “Both the riots-accused must be thrown out of the Congress party and the Gandhis must apologise. He said it was a travesty that they made former PM Manmohan Singh to apologise even though he did not figure in the scheme of things in 1984”. The very fact that the leaders reached the dharna site proves that they are active members of the party. It also proves that the Congress, as well as the Gandhi family, continues to nurture them secretly,” the Akali Dal’s Protesters alleged.